By the time long-lived marine vertebrates reach adulthood they have few natural predators. However, fishing gear set in critical estuarine and nearshore habitat can serve as anthropogenic “predators” to these megafauna. For larger marine megafauna such as sharks, marine mammals and sea turtles, fisheries-related mortalities are mostly due to incidental entanglement in gear such as gill nets and long lines. 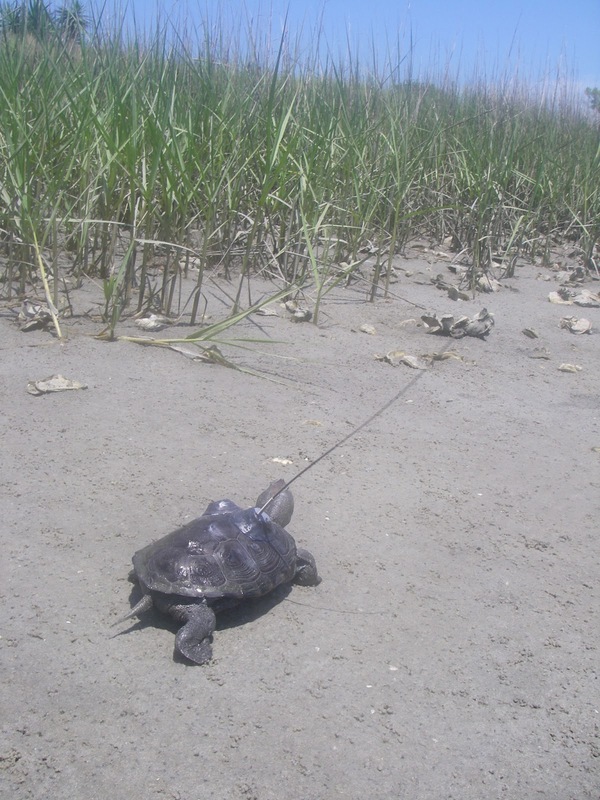 For the diamondback terrapin, a small Atlantic and Gulf Coast estuarine turtle, the main source of bycatch mortality is due to entrapment and subsequent drowning in commercial and recreational crab pots. High rates of bycatch mortality have been documented throughout the terrapin’s range and are a cause for concern as terrapins are considered a K-selected species. (K-selected means they delayed sexual maturity, have low fecundity, and a long lifespan compared to r-selected species, such as insects.) Trends from long-term studies in South Carolina and Maryland point to crab pot bycatch mortality as a major contributor to population declines and demographic shifts of diamondback terrapins. Crabbing is the dominant commercial fishery in North Carolina, and terrapin bycatch mortality has become a growing concern. The North Carolina Division of Marine Fisheries (NCDMF) is in the midst of revising their Blue Crab Management Plan and has requested scientific data on terrapin ecology and terrapin-crabbing interactions in NC. 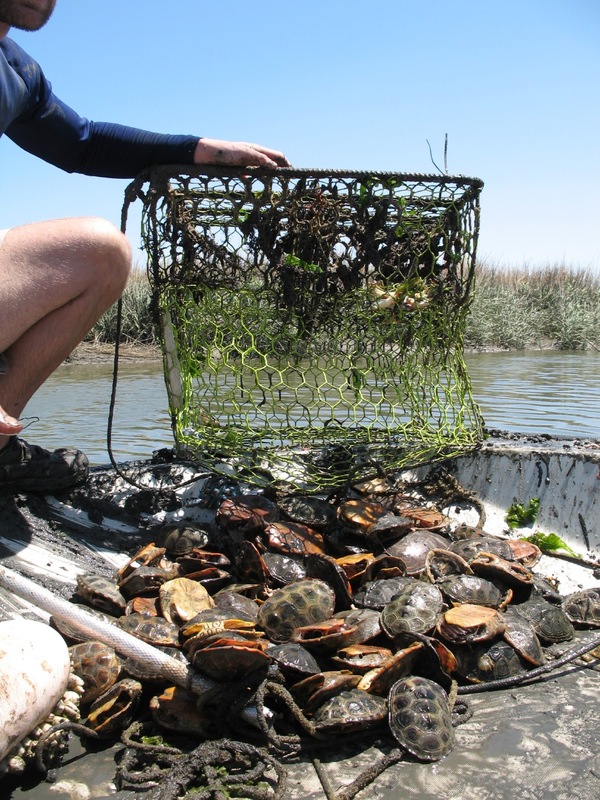 Enter an intensive, year-long study conducted by University of North Carolina Wilmington (UNCW) researchers aimed to 1) assess terrapin-crab pot overlap through mapping and to 2) explore bycatch risk based on both overlap and terrapin behavior. 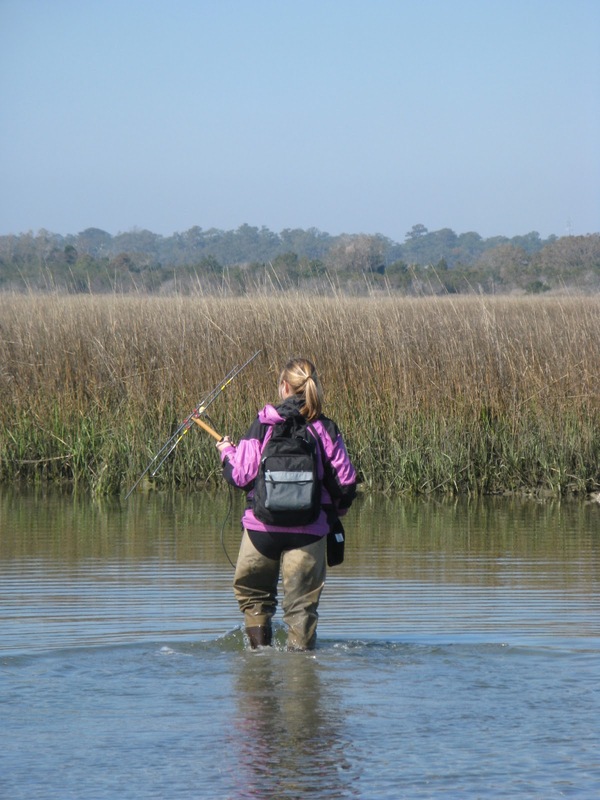 With the help of local crabbers and NCDMF, my advisor Dr. Amanda Southwood Williard and I identified local sites where terrapins and crabs co-occurred, and documented crab pot locations in order to monitor the movements and activity patterns of terrapins via radio telemetry. We found that bycatch risk was greatest in warm months (April – September) when terrapins shared shallow tidal creek habitats with blue crabs. Furthermore, actual bycatch events occurred at the site of the highest spatial overlap and bycatch risk. This study helped to show how the seasonal behavior and habitat use of terrapins can influence their crab pot bycatch risk. We also found that, similar to other studies, terrapin-crab pot overlap is not ubiquitous throughout the salt marsh ecosystem. Instead, bycatch risk zones exist around terrapin “hotspots,” possibly at terrapin breeding aggregations and/or shallow, narrow tidal creeks. In order to better identify high priority fisheries management areas, we recommend a broad scale assessment of terrapin-crab overlap that includes information on terrapin ecology, density and distribution (via field studies and aquatic, and visual surveys) and crabbing density and distribution (via fisheries data). Several different management tools have been suggested, such as bycatch reduction devices (BRDs), distance-to-shore restrictions, and time-of-year restrictions, some of which have already been implemented in other states. New Jersey requires BRDs on all crab pots within 150 ft. of the shoreline and Maryland and Delaware both require BRDs on non-commercial pots. Maryland also restricts commercial crabbing to the deeper branches of the Chesapeake Bay (<4m). Currently we are testing various BRD dimensions on commercial-grade crab pots along the NC coast to examine their effectiveness in mitigating terrapin bycatch while leaving crab catch unaffected. Harden LA, Southwood Williard A. 2012. Using spatial and behavioral data to evaluate the seasonal bycatch risk of diamondback terrapins (Malaclemys terrapin) in crab pots. Marine Ecology Progress Series, 467, 207–217. Hart KM, Crowder LB. 2011. 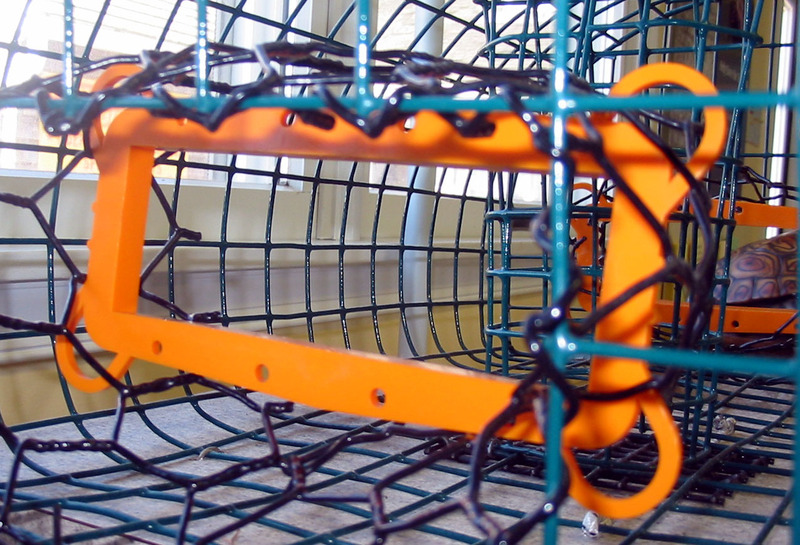 Mitigating by-catch of diamondback terrapins in crab pots. Journal of Wildlife Management, 75, 264–272. Dorcas ME, Willson JD, Gibbons JW. 2007. Crab trapping causes population decline and demographic changes in diamondback terrapins over two decades. Biological Conservation, 137, 334–340. Roosenburg WM, Cresko W, Modesitte M, Robbins MB. 1997. Diamondback terrapin (Malaclemys terrapin) mortality in crab pots. Conservation Biology, 11, 1166–1172. Next Post The Fisheries Blog gets recognition from Fisheries Magazine!